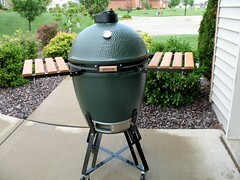 Since I've been blogging, I've been cooking on a Big Green Egg. But it dawned on me recently that as much as I evangelize the merits of the Big Green Egg, I've never actually written a review on the product. What prompted this review is the number of people that are coming to GrillandBarrel.com after doing a search for "Big Green Egg Review". Well for those of you that have gotten here through that method, here goes. For centuries, people have cooked in clay vessels. Evidence of clay cooking vessels have been found all over the world. From the tandoor cooker in India to the mushikamodo in Japan, it's believed that these are the precursors to today's kamado style cooker. Kamados became popular in the US after World War II. Today, there are a number of companies making kamado style cookers using ceramic and refractory materials in their construction. Big Green Egg began production in 1974, first using clay materials and finally the ceramic construction used today. Based in Atlanta, Big Green Egg is the world's largest producer and international distributor of ceramic, kamado style cookers. There are many advantages to this style of cooker and in particular, the Big Green Egg. Temperature Control - once the ceramic material comes up to temp, it retains the heat for hours and doesn't require a large fire to maintain that temp. Low Fuel Consumption - as stated above since the ceramic is radiating retained heat, only a small fire is needed for low temperature smoking and thus only a small amount of fuel is required. Grill or Smoke - Of course you can cook indirect on lots of grills, but few afford you the ability to smoke or grill equally well. Active User Community - There's a very strong following of fanatical owners of the Big Green Egg online. Called "Eggheads", you can find them hanging out at the Egghead Forum or gathering at regional "Eggfests" around the country. The granddaddy of all eggfests is in Atlanta in October called Eggtoberfest. There's plenty of advice, tips, techniques, and recipes willing shared among the loyal following. Of course there are some drawbacks to any product, and the Big Green Egg is no exception. Capacity - Although you can add additional cooking grates higher into the dome, there's no getting around the fact that capacity can be an issue if you often cook for large groups. Now by "large", I mean more than ~20 folks or so (depending on what your cooking). Portability - These things are heavy. As such, they're not great for tailgating, camping etc. Personally, I find that the advantages to a Big Green Egg outweigh the disadvantages. And since the product comes in sizes ranging from mini to X-Large, I'm confident that there's a size that's right for everyone. Since I acquired my Big Green Egg, the way we eat as a family has completely changed. I cook nearly every weekend and often times throughout the week. With a little practice, you can have the cooker running and ready to cook in less than 15 minutes even though it's charcoal. So being able to cook dinner after work is very easy to do. When I cook on Sundays, I am most often smoking (or cooking low & slow). This typically means a larger meal with plenty of left overs. 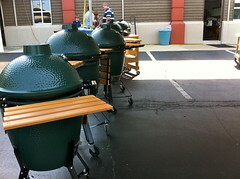 Throughout the pages of GrillandBarrel.com, you'll find lots of my own experiences with the Big Green Egg. So peruse the information here and let me know if you have questions or feedback on the product. Maybe I'll run into you at an Eggfest someday!